Many of us who live in the Pacific Northwest are familiar with Kitsap County’s historic town of Poulsbo, Washington. Perched on the shore of Liberty Bay (once know as Dogfish Bay) with a population of just under 10,000, Poulsbo is known as "Little Norway on the Fjord." Norwegians came to this area in the 1880s, drawn by water and mountain vistas that reminded them of their homeland, and abundant timber and fishing resources to support familiar industries they knew well. Their first name for the community was “Paulsbo”, meaning Paul’s place, after a village in Norway. In the mid to late 1890s, hundreds of Sámi immigrated to Alaska from northern Norway and Sweden. They were recruited by the US Department of Education and commissioned to teach the Inuit people of Alaska to herd reindeer. Many Sámi families lived and worked in Alaska until Congress passed the Reindeer Industry Act of 1937, which restricted ownership of reindeer in Alaska to the Inuit, and placed the management of reindeer herding under the Bureau of Indian Affairs. 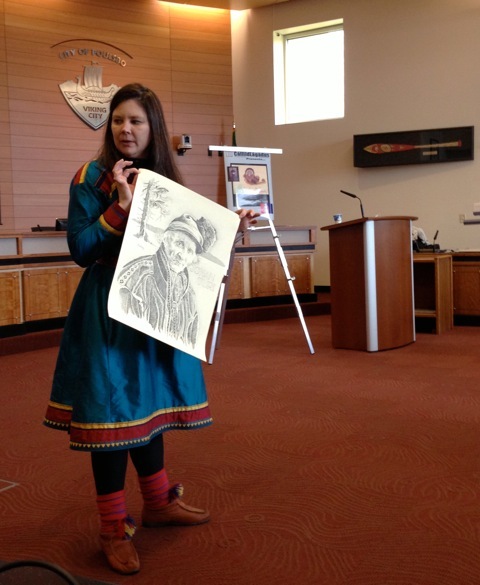 After this, many Sámi left Alaska and settled in Poulsbo. In her book “We Stopped Forgetting”: Stories from Sámi Americans, Ellen Marie Jensen shares firsthand accounts from the descendants of the Sámi who came to North America. She writes, “The title is intended to be a window into the ways that life stories reverse the process of assimilation through memory because assimilation depends greatly on forgetting. To stop forgetting is to remember the importance of all our cultural ancestors in our lived lives, which leads us to a better understanding of contemporary selves.” (p. 9). I had the privilege of meeting Ms. Jensen at an event sponsored by the Poulsbo Historical Society on Tuesday, January 8, 2013. (She was there to promote another book published by ČálliidLágádus, but that’s a story for a separate posting.) I purchased a copy of her book, and have been reading it with fascination. Teacher, freelance writer and translator, Ms. Jensen was born and raised in Minneapolis/St. Paul, Minnesota, but now lives and works in Deatnu/Tana, Norway. The book is an offshoot from her master’s thesis in Indigenous Studies at the University of Tromsø (2005). The Sámi-American experience is not widely known, and Ms. Jensen’s book provides valuable insight into it. I encourage all to read her book, and learn more about this Pacific Northwest immigrant community. You can purchase a copy at the Liberty Bay Books in Poulsbo or directly from the author on her web site: We Stopped Forgetting. + There is a big event at Pacific Lutheran University (PLU) this coming week: Sami People's Day, which is celebrated throughout Sápmi, the land of Indigenous Sámi in Norway, Sweden, Finland and Russia. The celebration commemorates the first international, pan-Sámi organizational meeting held in Trondheim in 1917, making the beginning of the Sámi rights movement. There are several events that will take place at PLU on Wednesday, February 6, 2013. + If you find yourself near Decorah, Iowa between now and November 10, 2012, you must check out the exhibition: The Sámi Reindeer People of Alaska. The exhibition is sponsored by Owen and Naomi Bekkum, was coordinated by the Sami Cultural Center of North America and Báiki: the International Sami Journal. The exhibition includes enlarged historic photographs, poems and family stories, and duodji. I am trying to locate a member of the Sami community who might be able to help me with a translation to English of the Sami national anthem, Sámi soga lávlla. Is there a native speaker who could contact me? There's a woman I meet at the Pacific Samily National Day in February 2013. Her name and contact information is below. She's also the author of the Pacific Sami blog. You can also try the Pacific Sami Searvi on Facebook: https://www.facebook.com/groups/pacificsiida/ Julie started this group in July of 2012. There are 142 members. You could post your request on that site.